Photo from Carmine Street Guitars courtesy of Sphinx Productions. (August 3, 2018 – Toronto, ON) When the 2018 Venice International Film Festival kicks off later this month, there will be a few Canadians in attendance. The last time a Ron Mann film was on the program it was 2014 and his must-see documentary Altman screened out of competition. This year he returns with Carmine Street Guitars. Set in what was once the centre of the New York bohemia, Greenwich Village, the area is now home to lux restaurants, and buzzer door clothing stores catering to the nouveau riche. However one shop in the heart of the Village remains resilient to the encroaching gentrification: Carmine Street Guitars. Poster for Carmine Street Guitars courtesy of Sphinx Productions. 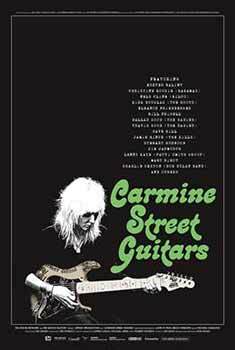 Featuring a cast of prominent musicians and artists, the film captures five days in the life of Carmine Street Guitars, as it examines an all-too-quickly vanishing way of life. The main focus of Carmine Street Guitars is custom guitar maker Rick Kelly and his young apprentice Cindy Hulej. They are renowned for their handcrafted guitars made from reclaimed wood rescued from old hotels, bars, churches and other local buildings. Nothing looks or sounds quite like a Rick Kelly guitar, which is the reason they are embraced by the likes of Bob Dylan, Lou Reed, Patti Smith and Jim Jarmusch, just to name a few. Kelly opened his store and workshop in Greenwich Village in the late 1970’s. 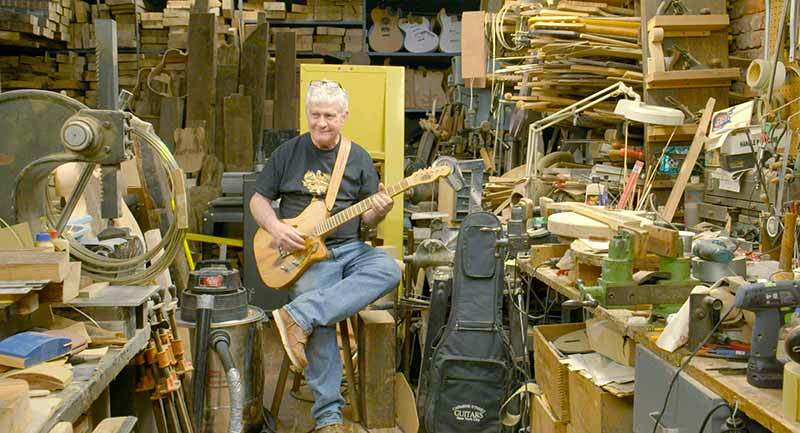 Today it is a mecca for people looking for a sound only a handcrafted guitar can produce. Written by Len Blum and produced and directed by Ron Mann, the 80-minute Carmine Street Guitars will have its World Premiere at the 75th Venice International Film Festival and will then be celebrated at home when it becomes Mann’s 10th feature documentary and his 8th premiere at TIFF. Click here for a link to the Venice International Film Festival and other August 2018 film festivals. Click here for more about Ron Mann.